After a collective gasp and sideways glances among the C2 team, we realized that we were standing in the same room as master luthier Bob Benedetto—the legend to whom Paul had been referring for hours. Admittedly, I didn’t ask the question, “Is Bob here?” I wrongly assumed he wouldn’t be toiling in the factory with the rest of his team. But there he was, head tucked, hands in motion, as he slowly sculpted a small body acoustic archtop from a piece of Sitka spruce, salvaged from a salt water bay where a mollusk had his way with the wood, creating a stunning gift from nature. But the story begins long before that. Decades before, in fact. 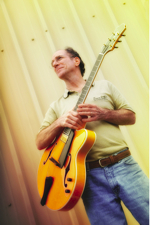 Born into a family of artists, cabinet makers and musicians (his grandfather made the legs on Steinway pianos), Benedetto made his first archtop guitar in 1968, with tools passed down from his grandfather and others that he made himself. As his name grew, so did the demand. From 1999-2006, Benedetto had a licensing agreement with Fender Musical Instruments to produce his models in a small, controlled manufacturing environment. But, for a man who nurtures a love affair with his craft, Benedetto was anxious to be back on his own. In 2006, he joined forces with Howard Paul to take the Benedetto guitar brand worldwide. The two have been making music and some rather stunning works of art ever since. The process of crafting a Benedetto guitar is long, and tedious, and requires the skilled hands of masters. 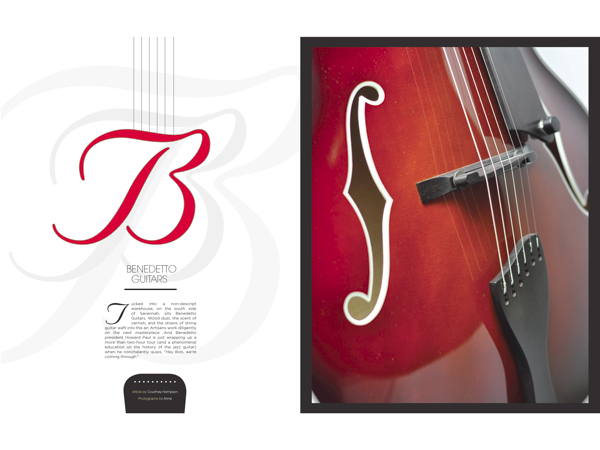 The precision and personal attention to each instrument is what makes each Benedetto guitar special. The perfect piece of wood is selected from the 103 degree “wood room,” where Benedetto stores unique finds from all over the world (and where we spent 10 minutes sweating along with the story). Once the piece of wood is selected, it is carved diligently by hand to create the top and back of this hollow-bodied instrument. Every tree is different hence, every Benedetto guitar is unique. Master finisher Matt Eady hand sands and applies the color stain to each perfectly crafted body, in painstaking, repetitious manner. Such care is taken that only one instrument a day gets Eady’s attention. Master luthier Damon Mailand works on the final elements, adding the strings and finger plate, which “floats” magically above the body. 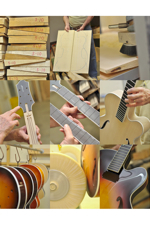 Don’t be mistaken—even though Benedetto receives worldwide acclaim, Bob personally signs and packs every instrument. Nothing leaves the factory without his approval. That is probably why Bob Benedetto is acknowledged as today’s foremost maker of archtop guitars. Over a prolific four-decade career, he has personally handcrafted nearly 800 instruments, including 500 archtops. Today, Benedetto guitars appear on countless recordings, TV and film soundtracks, in videos, books, magazines, concerts, and museums, including the Smithsonian Institution. “I can think of no two people in the history of lutherie who have done more to increase appreciation for the archtop guitar than Bob and Cindy Benedetto,” said Randall Kremer, the Smithsonian’s director of public affairs. While the artists are at work, Paul oversees the day-to-day operations and handles 100 percent of sales for the company. While describing his crazy schedule, his phone rang and he rolled his eyes with an exaggerated smirk. “I’m also the secretary,” he chuckled as he covered the receiver with his hand. Paul is a busy man and a talented jazz musician in his own right. When we sat down, he had just played a dozen gigs, in 10 days, while also moonlighting as one of the chief volunteers responsible for organizing the Savannah Jazz Festival. This year’s festival poster features a portrait of him. And as the festival had just wrapped up its week-long schedule of performances, Paul looked exhausted, yet proud. No rest for the weary, but at Benedetto, Paul is able to combine all of his loves since he admittedly has a hard time saying no. Paul has always been surrounded by music. He started playing guitar at age four, jazz guitar at 10, and was playing professionally by the time he became a teenager. At 21, he was teaching guitar at the college level. Living in Atlantic City, NJ, there were plenty of gigs available for Paul, but he soon learned that the bar scene—“booze, drugs, and loose women,”—was a bad environment. So he went to college, graduated from the University of North Carolina and was soon back in Atlantic City. Again with the booze, the drugs, and those darn women. So, his next escape was the Army, where he spent 10 years as a logistics officer. After the Army, Paul spent 10 years as a logistics executive for Chatham Steel. But, he “gigged” the whole time. “I never stopped playing,” he said. Finally, in 1996, he was ready for his first Benedetto guitar. With a three-and-a half-year wait on his hands (as if you needed anymore proof that these are truly custom works of art), Paul had plenty of time to become friends with Bob Benedetto. Their friendship grew, and a decade later their partnership was sealed. Now, four years into the journey, the duet crosses paths each day in the Savannah factory, where a tireless crew works to ensure that the artistry of jazz is as present in the instrument as it is the musician. Rosés are Pink...and Perfect for February! Mamma Mia! An ABBA-solute Blast!